VINTAGE ART NOUVEAU LADY FLOWING HAIR PENDANT PICTURE LOCKET . Shipped with USPS First Class Package. Laguna Beach, California for many years. A lot of these pieces were made by various local artists from the 1960’s to the 1990’s using both new and recycled components. Stone is about 3.5 cm in length. Found in the jewelry box of my dear Aunt Bernetta, who passed away at age 100 in 2005. New ListingAntique Vintage Art Nouveau Gold Filled Etched Locket Necklace~Sapphire~NR! This locket features a prong set blue sapphire and is set in an etched design as the head of a flower. Condition is excellent on this locket with working hinged clasp and this piece is unsigned. Hallmarked sterling on two of the bows and on the clasp. They are being sold "as found" condition. A WORD ABOUT LINENS AND TEXTILES. 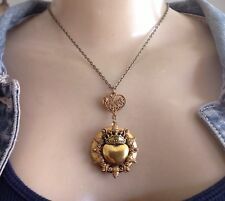 The locket itself is just under 2" long. Laguna Beach, California for many years. A lot of these pieces were made by various local artists from the 1960’s to the 1990’s using both new and recycled components. Beautifully crafted Vintage Victorian Art Nouveau Bird Chrysoprase Dangle Necklace Choker features a detailed bronze deep relief casting of a bird holding a cherry on a stem in it's beak. It has a jeweled red eye. There is an 3/4" X 1/2" oval Chrysoprase cabachon under it's feet. Two smaller Chrysoprase cabochons ,7 mm X 6 mm adorn a pair of dangles . 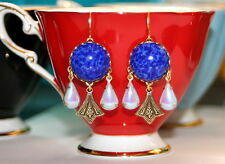 In the middle dangles a 11/16" faux tear drop pearl. It measures 15-1/4" from clasp to eyelet, on the smaller side. (A necklace extension could be added if needed) A true collector's item!! THEY ARE IN GOOD TO EXCELLENT CONDITION. ITEM MAY BE LARGER IN PICTURE THAN IT ACTUALLY IS. ALTHOUGH I TRY TO GET COLOR AS CLOSE TO THE ORIGINAL AS POSSIBLE. YOUR MONITOR MAY SHOW IT SLIGHTLY DIFFERENT DUE TO SETTINGS. 5 necklaces and 4 pairs of earrings (for pierced ears). The brooch is made in an art nouveau style with flowers, leaves, and dotted lines for the setting. In the center of the setting is a large oval faux opal. There are round purple rhinestones in flowers around the setting. SEE PHOTOS FOR DETAIL. WEIGHS 17.6 GRAMS. Vintage ART NOUVEAU CAMEO LAVA STONE BROOCH pin.... "AS IS" CHIPPED ON BOTTOM CORNER PLEASE LOOK AT ALL PICTURES.... Shipped with USPS First Class Package. This gorgeous pendant is 1 5/8" long including the bail and it is marked 925 NF. VINTAGE SCANDINAVIAN 830 SILVER ART NOUVEAU ROSE BROOCH SIGNED . Shipped with USPS First Class Package. ESTATE ITEM,PREOWNED AND USED. PICTURES SAY IT ALL. PLEASE LOOK CLOSELY AT PICTURES AND ASSES YOUR OWN RISK. I DONT KNOW WHAT KIND OF STONE IT HAS BUT THE RED COLOR IS WITHIN THE STONE. SOLD AS FOUND. SALE IS FINAL,NO RETURN, NO EXCEPTIONS. ASK QUESTIONS BEFORE BIDDING. GOOD LUCK. This pendant is at least 70 years old. She said an admirer made it for her when she was a young woman. This is a one of a kind piece that no one else will have! The detail is amazing! Wonderful VINTAGE ART NOUVEAU VERY LARGE BRASS AND FACETED AMETHYST STONE BROOCH. Good vintage condition showing some age and wear. Please look at all photos to help determine condition. Lovely Brooch Shipped with USPS First Class Package. A lot of these pieces were made by various local artists from the 1960’s to the 1990’s using both new and recycled components. Stunning and bright! Pendant section is 1-1/2" long by 1" wide. Center stone has an open back. Has a hook clasp. They are described to the best of our knowledge. 925 sterling Sliver. The condition of the ring is pre-owned. This bewitching ring has incredible detail and is made from. And is a size 7. Brass bale and face are riveted on. The bakelite tests positive with Formula 409. The chain is 16" in length and a delicate strand to match the delicate pendant. This pretty necklace was given to in the early 1970s by my Grandfather. 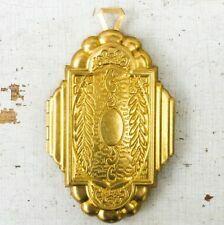 Vtg art nouveau Renaissance pendant on a beautiful spaced filigree chain. Has a barrel type clasp. In excellent vtg condition. Unusual piece. ALL IN ALL, THIS IS VERY WELL MADE & BEAUTIFULLY HAND SCROLLED PIECE, WHICH IS A WONDERFUL EXAMPLE OF THE TALENTED HIGH QUALITY JEWELRY DEMANDED BY KABANA ARTISANS. IT WAS IN ENVELOPE LABELED KABANA STERLING SILVER/AQUAMARINE, & DATED 1976. A great Sterling ring...has an all over design of bellflowers...marked Sterling on the inside...from the 1920's to 30's...in really great condition...appears to have been sized so the design is compromised in that area...or it could just be the way it was made...it's about a 5.5 ring size and about 5/16" wide...a really pretty ring to wear with anything! There is an old repair. It is unmarked. Acid/scratch tested with Sterling results. Total weight is. 6 grams. Ready to wear. NO MORE EXCEPTIONS. Many signed and unusual pieces. Our offices are smoke free, but can not account for previous owners! The result is a feminine and gauzy portrait. It is signed by maker Diolot. 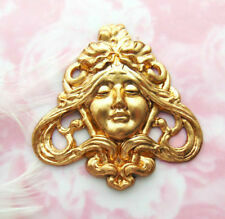 A lightweight, solid gold piece, this brooch is a classic example of Art Nouveau jewelry. The repousse design depicts the profile of a beautiful woman. Colors may appear different due to variances in monitor etc. Cleaning may be required based on personal preferences. I am not a jewelry expert but I do know this piece is just so beautiful. The woman is standing with a raised hand holding a lily, a flowing dress with lilies wrapped around her in perfect Art Nouveau style. VintAge ArT DeCo NoUveAu CoBalt BluE LuCite FaNcy CoLLar ChoKer NecKlace~LoVely!